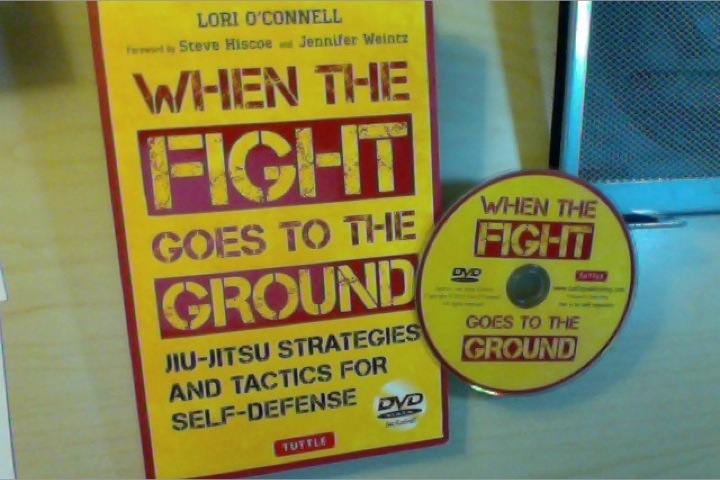 When I got a copy of When the Fight Goes to the Ground: Jiu-Jitsu Strategies and Tactics for Self-Defense, Sensei Lori O'Connel's new book, I didn't know what to expect. I've done minimal ground martial arts in the past, and striking as a Wing Chun practitioner is what I do today. I much prefer hitting and kicking someone (or someones) and running like heck, than getting into a gorilla wrestling match, especially if the other guy is the gorilla. So I was pleased that Sensei O'Connell addresses the reality of the street in her book. One of the groups she wanted to help with this book are law enforcement officers. The founder of her branch of Jiu-jitsu (Can-ryu) was a Canadian Military police officer and Ottawa municipal police officer. She clearly differentiates fighting for competition and fighting on the street. Most grapplers today are competitive fighters. As such they learn moves that are allowable in the ring, but perhaps not safe or smart in the streets. On page 18, O'Connell explains how passing the guard scores points in BJJ/MMA but absolutely useless, and most likely dangerous to your health, in a real fight. The Best Part of the Book, isn't Even the Book! What I especially liked about When the Fight Goes to the Ground is the free bonus DVD! I have countless martial arts books, many of them very good, but full of photos. I don't know about you, but I find it tedious trying to break the code and understand what they want to show me from a handful of a-moment-in-time photos. I feel learning ground fighting moves through one-at-a-time photos is harder than learning striking moves by photo. When grapplers are tangled up like pythons, I have no idea who is doing what. The videos on the DVD clears up the confusion. I can pause it. Rewind it. Even play it in slow motion. Great! Talking about photos. This book uses high quality glossy paper and high quality COLOR photos. This makes it easy to see. Sensei O'Connell trains in Can-ryu Jiu-jitsu. It is specially developed for street-based encounters, and she is one of its top instructors and "experimenters." She's been tasked to develop and test special jiu-jitsu moves that work on the street, not in an MMA competition. I like that. Especially since I'm not a competitive fighter and more concerned with my family's self-defense. Her style of Jiu-jitsu includes many debilitating attacks. When the Fight Goes to the Ground is well organized. For instance, it has four chapters that I would consider useful for beginners like me, but can also serve as a great refresher for advanced grapplers. Nothing wrong with reviewing the fundamentals. The chapters go over things like understanding the ground, how to stay safe while on the ground, body shifting control, and attacks to vital targets from the ground. As primarily a stand up striker I felt these chapters gave me the essence of what is important when fighting from the ground. Next, you'll find seven chapters that go over basic positions to defend yourself from. Such as against the standing attacker, a mounted attacker, from the guard, defending on your back, while kneeling, etc. This is new to me since I'm not a bjj or MMA fighter. However, I suspect learning how Lori and Can-ryu do it is a great experience for ground warriors from other schools. Also, a half-dozen chapters touch on restraints and locks, which is great for normal social aggression situations. But if you're going against truly violent aggressors, well then, locks and restraints can quickly turn into breaks... the bad guy can't use that limb anymore. The final chapters are my favorite. These focus on fighting on the ground against knife attacks and multiple attackers. Probably the two most common situations you'll run into on the street (knife attacks can be translated into weapon attacks). After reading her book and especially after watching the DVD, I still wouldn't want to fight from the ground or get taken down. Honestly, as a Wing Chun practitioner I don't think I'm going to spend many hours drilling the dozens of techniques she carefully reviews in the book and DVD.